↑ Omoigui, Nowa. «Nigeria: The Story of Bakassi Peninsula. Bryce, James B., Holland Thomson, and William M.F. Petrie. The Book of History: The Causes of the War. The Events of 1914—1915. Vol. 16.: Grolier Society, 1920. Burg, David F., and L. Edward. Purcell. Almanac of World War I. Lexington, KY: University of Kentucky, 1998. Damis, Fritz. Auf Dem Moraberge — Erinnerungen an Die Kämpfe Der 3. Kompagnie Der Ehemaligen Kaiserlichen Schutztruppe Für Kamerun.1929. Berlin. Dane, Edmund. British Campaigns in Africa and the Pacific, 1914—1918, London: Hodder and Stoughton, 1919. Dobell, Charles M. United Kingdom. War Office. Cameroons Campaign Army Despatch. The London Gazette. 1916. Dornseif, Golf. 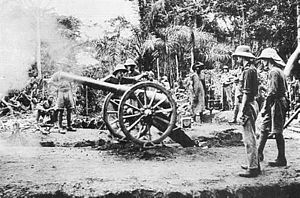 British-French Rivalry in the Cameroon Campaign. Elango, Lovett. The Anglo-French 'Condominium' in Cameroon, 1914—1916: The Myth and the Reality The International Journal of African Historical Studies, XVIII, No. 4 (1985), 656-73. Henry, Helga Bender. Cameroon on a Clear Day. Pasadena, CA: William Carey Library, 1999. Hilditch, A. N. Battle Sketches, 1914—1915. Oxford University Press, 1915. Innes, Arthur D., Redway, H. W. Wilson, Sidney Low, and Edward Wright.Britain’s Conquest of the German Cameroon. Ed. J. A. Hammerton. The War Illustrated Deluxe 1916: 1178—1182. Scribd. 2007. Web. Ngoh, Victor J. Cameroon (Kamerun): Colonial Period: German Rule. Encyclopedia of African History. Ed. Kevin Shillington. Vol. 1. : CRC, 2005. 347-49. O’Neill, Herbert C. The War in Africa and the Far East. London: London Longmans Green, 1918. Paice, Edward. World War I: The African Front. Berkeley & Oackland: Pegasus, 2008. Quinn, Frederick. An African Reaction to World War I: The Beti of Cameroon Cahiers d'Études Africaines, XIII, Cahier 52 (1973), 722-31. Reynolds, Francis J., Churchill, Allen L., and Miller, Francis T. The Cameroons. The Story of the Great War, III. 1916.